Located in southwest Springfield, near the intersection of Kansas Expressway & Battlefield Road. Landmarks like SkyZone Indoor Trampoline Park and Classic Rock Coffee make us easy to find. Our south clinic offers more services under one roof than you can imagine! PT, OT, and Certified Hand Therapy are offered from 7:00 am to 6:00 pm Monday through Friday. Unique equipment at our clinic include the Power Plate which uses vibration technology to strengthen muscles, Pneumex unweighting system to take weight off the body as patients learn to walk again or correct improper gait mechanics, and advanced biofeedback therapy tools for symptomatic relief of severe chronic pain. 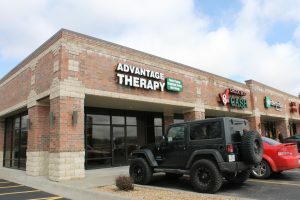 Situated on the northeast side of Springfield, Advantage Therapy-North is a fantastic resource for people in pain living or working in north Springfield. Our clinic is located in the Kmart Shopping Center near the intersection of Glenstone Avenue & Kearney Street. We’re across from Walmart, near Fantastic Sam’s and Sally Beauty Supply. Our north clinic offer physical therapy services for both injured workers and commercial insurance patients. Case managers, employers, and physicians alike value our location due to its close proximity to industry and easy accessibility to I-44 and Hwy 65. Our large parking lot can easily accommodate semi-trucks. We treat the whole body, head-to-toe, and even offer special services tailored to injured workers like job simulation tasks and work conditioning. Our flexible hours with early morning and after work appointments available make coming to Advantage Therapy an easy choice. At Advantage Therapy, we recognize that expert care should be accessible to all people without having to drive nearly an hour to therapy appointments. In 2015, we answered the requests of doctors and insurance networks and opened Advantage Therapy-Monett. Located in the well-known Stonegate Plaza on Highway 60, our clinic is easy to access and located near landmarks like Walmart, Bayou Restaurant, and Verizon. Services at our Monett clinic include physical therapy, occupational therapy, and certified hand therapy to treat patients of all ages and diagnoses. Common reasons people come to Advantage Therapy-Monett include: therapy following carpal tunnel surgery, chronic back and neck pain, limited mobility for those with Parkinson’s Disease, rotator cuff injury, and more. Our balance program sets our clinic apart from others in the area. Using the Biodex SD and advanced training and treatment techniques, our physical therapists are experts in getting to the root cause of your dizziness, frequent falls, and vertigo symptoms. We search for the underlying cause of your problem and create a custom solution to get you back on your feet being active and enjoying life! Advantage Therapy-Monett has bilingual staff and is a first-choice among Spanish speaking patients. Effective communication is important so that we can understand your condition and complaints and choose the right treatment for your pain. In addition, we value patient privacy and have private treatment rooms to make our patients feel comfortable. We treat workers’ compensation injuries and are always looking to make new connections with HR and safety personnel at local employers to help reduce injuries in the workplace. Because we treat injured workers, our clinic hours are flexible to meet the needs of those working day and night shifts. We schedule appointments from 7:00 a.m. to 5:00 p.m. to meet our patients’ needs. 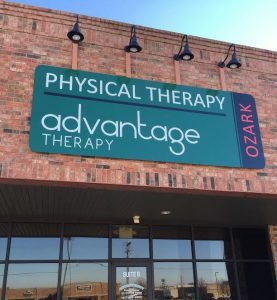 In November 2015, Advantage Therapy had the opportunity to expand to Ozark, Missouri to offer our unique brand of therapy to people living in the Ozark, Nixa, and Branson areas. Our new clinic caught on quickly as word spread about us in the area. We are currently offering physical therapy, occupational therapy, and certified hand therapy at our Ozark clinic. This clinic is open daily from 7:00 a.m. to 6:00 p.m. to treat patients with a wide variety of diagnoses including chronic pain, thoracic outlet syndrome, total knee replacement therapy, and chronic migraines. 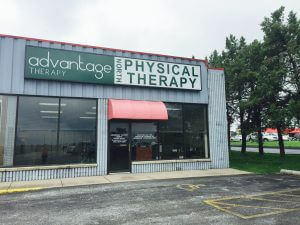 Advantage Therapy-Ozark is located on N. Farmer Branch Rd., just north of the intersection with Hwy J/CC. We are across from Divine Veterinary Clinic, and near Lawrence Drug and Sharlin Health & Neurlogy (link to sharlinfxmed.com). Farmer Branch Rd. runs behind James River Church and connects the Millwood Golf Course to Hwy CC. As the Ozark clinic grows, we are constantly adding new services as they are requested by physicians, case managers, and insurance networks. With this being said, we are confident that Advantage Therapy-Ozark offers more services than any other therapy clinic in the area!